Like it or not, we humans spend a lot of time in the smallest room in the house a.k.a. the toilet, the loo, the john, the W.C., the can. But this room is usually boring, bland and functional at best. Even without the dribbles on the seat and puddles on the floor left by lads who need to go to Aim-Your-Weapon School, the loo is usually a pretty uninspiring place to be. I had a cunning plan to change all that, at my house. What I needed was a window of uninterrupted DIY time. It's my Mum DIY philosophy that "it's better to ask forgiveness than permission". I found these beauties at the school gala, being as I am drawn to all things vintage. At some point (perhaps while making a papier mache pinata?) I conceived the idea to use the books' pages as wallpaper in my ugly, boring loo. I'm no expert at wallpapering, but this I reckoned I could do. A layer of "wallpaper" would disguise the butchered wall surface, left from when I scraped off the 80's vinyl wallpaper the last owner left. I'd done my best to fix it, but sanding and patching and paint can only do so much when your walls are that bad. And as The Nester says: you can't ruin something you already hate. So take a risk. Now all I needed was for my decoratively conservative hubby to be away for long enough so I could complete the project and show it to him, fait accompli. You know me. Always impulsive. One day last week up to my ears in the middle of Paris Party Prep, I was undercoating my old whiteboard with Resene Smooth Surface Sealer (to turn it into a sidewalk blackboard), and since I had the brush in my hand and the tin of paint open, I impulsively undercoated the toilet panelling. I'm crazy like that. Which meant of course, that now I'd started I had to finish the job before hubby returned from England on Friday. Because I didn't have enough projects on the go, already right now, aye? I fitted in a couple of top coats on the paneling in between party prep, food dispensing and kid-wrangling (using a can of mis-tint white enamel I scored from Resene). It took me from 8.30pm til 11.20pm to paper the whole loo with the pages from the annuals. To say I was pleased with the result would be an understatement. The boring-est room in the house is now the most interesting. Quirky? Yes. Awesome? Yes! A big hit with the family? YES! But the question you all have burning in your minds: did hubby LOVE it or LOATHE it? Did the risk pay off? 1000 times YES. He LOVES it. On the day he arrived, he's no sooner got in the door and dumped his bags when the kids insisted that he "use the facilities" asap. When he pushed open the door, this is what he said: "Oh WOW! that looks AMAZING!" So yeah, my risk paid off. But I'm pretty sure that if I'd told him what my idea was, he'd have thought I was off my rocker. 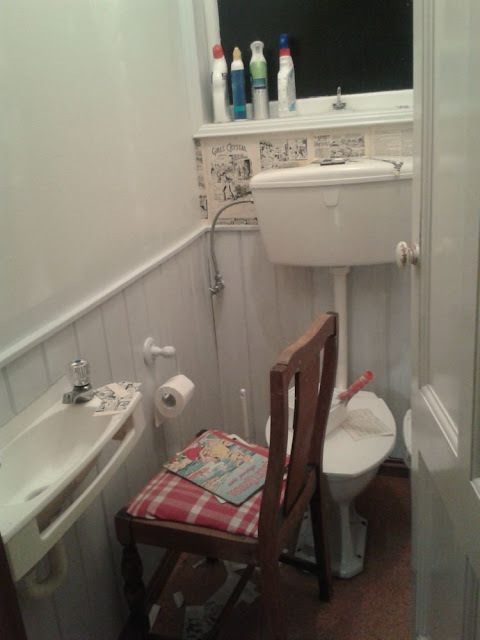 "Mum, our loo looks like it belongs in one of those cool restaurants....!" "I just love going toilet now - it's so interesting! So much to read!" "Hurry up! I need to go toilet!" "Hang on I'm just finishing this story..."
So yeah. I'm super-glad I took a risk with my loo-decor. 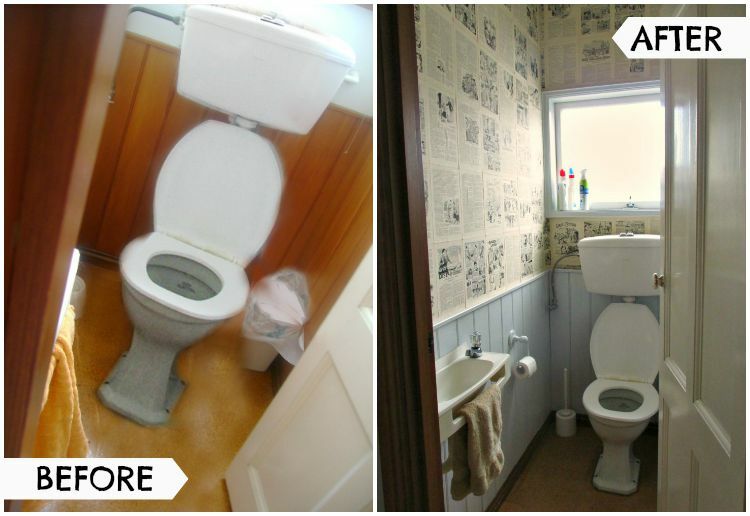 The Cost to turn my loo from "naff" to "fab"?? $8 for a tin of mis-tint enamel paint, and $1.50 for three retro annuals at the school gala. *Wallpaper Glue: cornflour (cornstarch) mixed with boiling water to a runny consistency and applied with a small paint roller. I rolled the glue onto the wall and then positioned the pages, starting from bottom-left above the wooden paneling and then working left-to right, row upon row. I was very careful when removing the pages from the binding to not tear the edge; they came out very easily (they are OLD after all). I used a craft knife to cut around light switches, piping etc and patched any gaps with extra pages, cut to roughly fit, then trimmed with the craft knife once in place. The cornflour glue dries hard, just like papier mache - no special wallpaper glue needed! 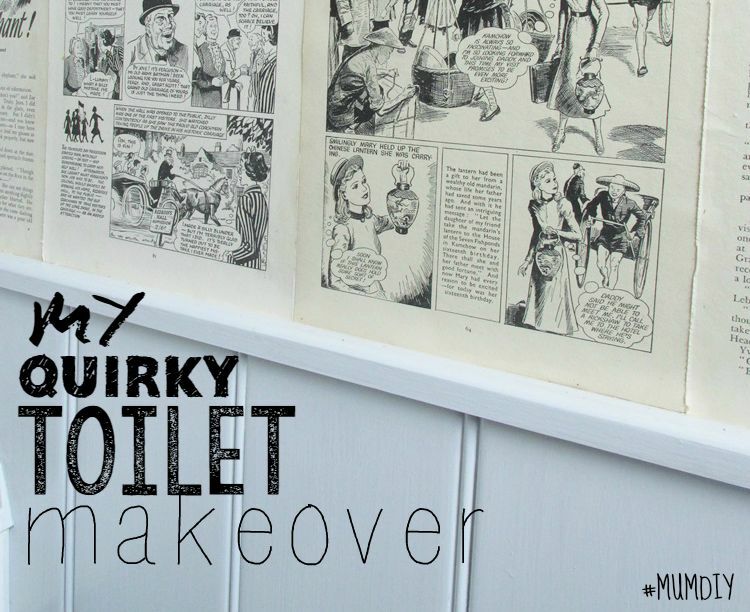 I LOVE my quirky Loo!